40 page science book with materials You know the letters of the alphabet. Get ready for the Alphabet of the Universe!. Split water into rocket fuel. Pop hydrogen!. Hunt for naked protons. Flame test salts. Grow palm-sized crystals. Design your own crystal garden. 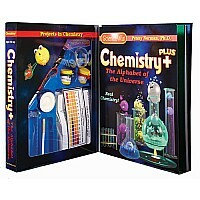 Act out the roles of electrons & protons Item #7810. list price $21.95 USD An exciting set of selected experiments designed to make elements elementary and explore the periodicity of the periodic table. Learn about atoms and the stuff they are made of - protons, neutrons and electrons. This beautifully illustrated book takes children through the alphabet of the universe. Warning: This kit makes use of chemicals which may be harmful if misused. Read cautions on individual containers carefully. Not to be used by children except under adult supervision. 10+ activities with easy to follow step by step book. Contains pH indicator sticks, graphite sticks, test tubes, connectors, CaSO4, CaCO3, magnifier, periodic table charts, electron, proton & neutron cut-out and a 48 page book.